Back in October, Oracle first announced the open source Fn Project at the JavaOne conference. Since then, the team here at Serverless has kept a keen eye on it. More function providers means more freedom for FaaS users & less vendor lock-in. This is one of our driving principles behind the Serverless Framework. 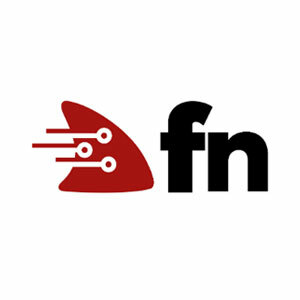 The Fn Project uses a vendor agnostic approach, leveraging containers to allow organizations run Fn either on premise or in their cloud of choice. Another driving force behind the project is: a clear separation of serverless & container orchestration is important. So, whether you're on Kubernetes or any other provider, Fn is agnostic when it comes to your container orchestration of choice. The platform is container-native, enabling users to write functions in any programming language, with excellent support for local development and testing. Fn even allows devs to “bring their own Dockerfile” such that ANY containerized code can be used as a function. The Fn Load Balancer (Fn LB) allows operators to deploy clusters of Fn servers and route traffic to them intelligently. Most importantly, it will route traffic to nodes where hot functions are running (to ensure optimal performance), as well as distribute load if traffic to a specific function increases. Fn FDK’s (Function Development Kits) are aimed at quickly bootstrapping functions in all languages, providing a data binding model for function inputs, making it easier to test your functions, and laying the foundation for building more complex serverless applications. Fn Flow allows developers to build and orchestrate higher-level workflows of functions, all inside their programming language of choice. It makes it easy to use parallelism, sequencing/chaining, error handling, fan in/out, etc., without learning complicated external models built with long JSON or YAML templates. For more information on the Fn Project and why they built it, I highly recommend checking out this post. Starting today, you can now deploy your Fn functions using the Serverless Framework and the familiar serverless.yml config we have all grown to know and love. Fn functions run in Docker containers, so you need a running fn service in order to run it. See the guide on installing Fn to finish setup. The Fn Project structure is similar to all other Serverless Framework providers, with one tiny difference. Instead of a handler property pointing to where the code lives, the function code location is driven by convention. The function key will reference the folder path, and inside that folder path it will look for a func. [Your Runtime] (a.k.a func.js or func.go). Use this method when you have updated your Function, Event or Resource configuration in serverless.yml and you want to deploy that change (or multiple changes at the same time) to your Fn cluster. The Serverless Framework translates all syntax in serverless.yml to Fn calls to provision your functions. For each function in your serverless.yml file, Fn will create an Fn Function. If you have questions or comments about the integration, we'd love to hear from you in the comments below or over on the serverless forums. Can't wait to see what you build! AWS Lambda Golang support is one of the most exciting announcements of 2018. Here's a quick template for using Go with the Serverless Framework!